I own a 2016 XR and recently mounted a full Akra exhaust from a 2010 RR . Had to adjust the outlet flanges to the XR (smaller diameter) but everything else fitted perfectly. One problem remains: the rear footpeg. It can't be mounted anymore as the RR exhaust has a different angle. 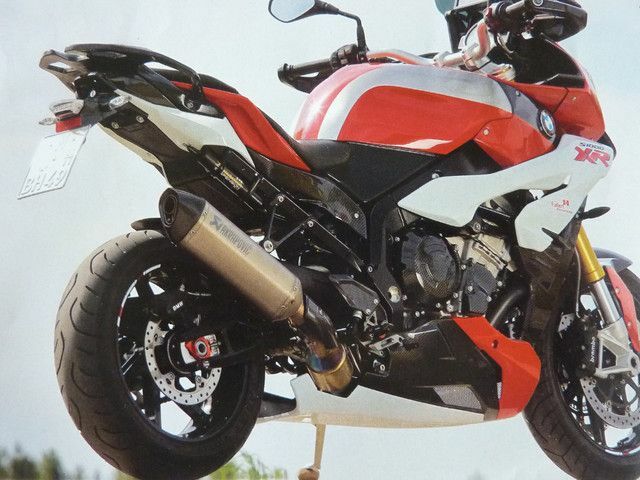 I found a pic of another XR with the Akra mounted , but with some other footpeg. I' ve been searching the net to find out what bike this is from but no luck so far. Any of you guys have any idea? That bike belongs to a spanish member called Belmar. no luck so far on the footpegs. Seems like the member Belmar who posted the pic, doen't own the bike. I have ordered a piece of stainless pipe to match the exhaust and make it a bit longer. Then adjusting the position of the oem pegs should work. I prefer not to weld anything because a, I can't do it and b, it's not a straightforward weld to do. that does look good and probably would'nt be as loud. The exhaust is the least that was done to that bike if you study the photo particularly the fact the bike hadn’t been around all that long when the photo was posted. I've posted this picture on another thread but here are both bikes together. Laser beams. Is it laser beams? Please say it's "laser beams" - that would be so-o cool! I can't tell from the photos, but that first one looks super-cool and may have been lowered? I’m afraid you have lost me Laser Beams? I was hoping that a light-hearted call for laser-beams might prompt a bit of enlightenment, is all.